If you’ve decided to grind your own meat or other food products, you’ve come to the right place! We checked out a variety of options to find 10 of the best meat grinders currently on the market. Since you’re taking this task into your own hands, let us help with the research. Bottom line: These are the kitchen accessories you want both at home and at work to take your meat to the next level. So let’s get started! 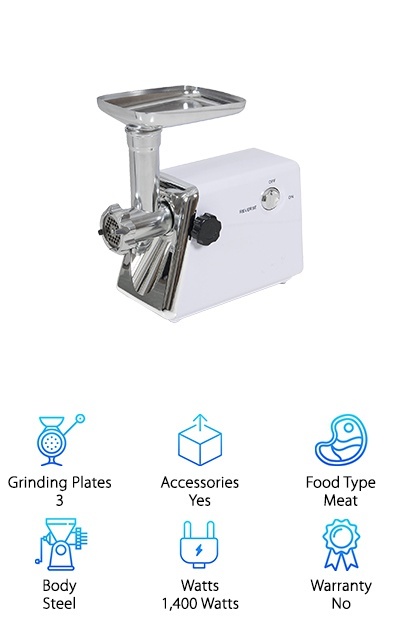 Grinding Plates - Our meat grinder reviews all include the number of grinding plates you'll receive with your purchase. The plate is a removable, flat piece of metal with holes cut into it. The smaller the holes, the finer the grind. Accessories - While some meat grinder models are more basic, others come with cool accessories like sausage stuffers. Sausages, snack sticks, pet food… anything is possible with the right equipment. We’ll let you know if your grinder comes with any extras! 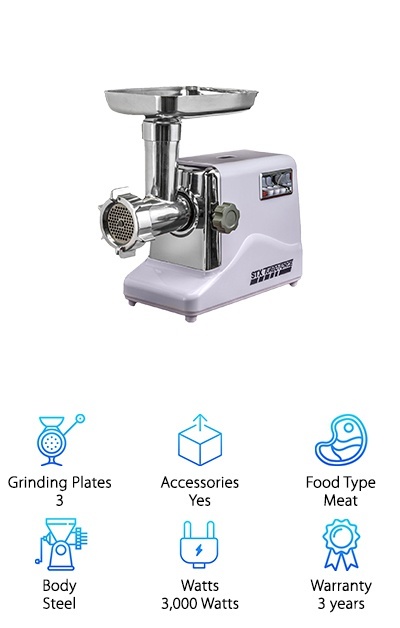 Food Type - Meat grinders are built to process all kinds of meat, including beef, chicken, elk, venison and whatever else you have available. They’re not just limited to meat, however. Certain types of grinders may surprise you with their versatility. Body - Most grinders, whether electric or manual, are made from either steel or plastic. The choice of materials will alter the construction and the appearance of the device. At a glance, we’ll let you know what’s grinding up your meat. Watts - The number of watts you want will depend on whether you’re buying a meat grinder for your home, for a small shop or restaurant, or for a large production facility. The machine’s power usage is a good indication of processing speed. Warranty - A warranty in your pocket is always a good idea when you’re working with a new appliance. We’ve clearly marked whether your meat grinder of choice comes with a warranty, and how long it will last. We’ve got you covered! Now that you know how to pick out your new meat grinder, let’s head to the reviews. Here’s the deal: if you’re in a rush, just check out our top pick and our budget pick. Both are wonderful items, and they were picked out as big winners by our reviewers. Just below, you’ve got the rest of our top ten. 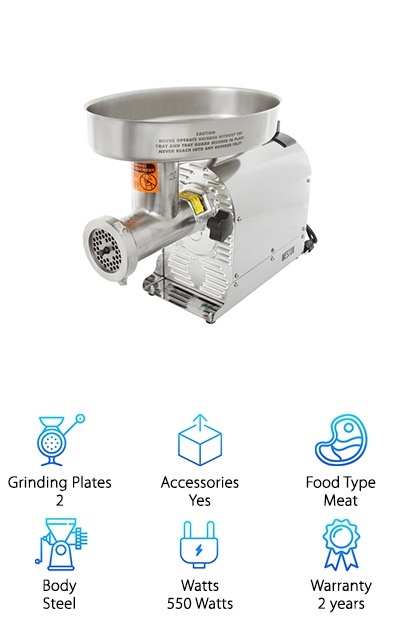 If you’re looking for a brand-new meat grinder, you’ve found the right place. Let’s get started! Our electric meat grinder reviews begin with our top pick, the Weston Pro Series Electric Grinder. This machine is a pro! And the accessories are just awesome. Here’s the scoop: this grinder will be the perfect fit either in your home or in a shop or restaurant. It’s built with steel gears and a lubricated, air-cooled engine, with an offset head design. It’s a real beauty! The accessories include a grinding knife, coarse and medium grinding plates, and how about making your own sausage? Three sausage-stuffing funnels and a snack stick funnel also come with your purchase. Hunters can process boar, bear, venison, and other big game. Pet owners can make their own pet food easily by grinding up turkey, chicken and other high-quality ingredients for man’s best friend. Foodies who want to embody the farm-to-table movement will love giving this machine a try. This powerhouse, 550-watt machine comes with a 2-year limited warranty. What are you waiting for? Our budget pick is perfect for a night at home, making pasta or burgers from scratch. That’s right: Not only is this an affordable grinder, it does far more than just meat! 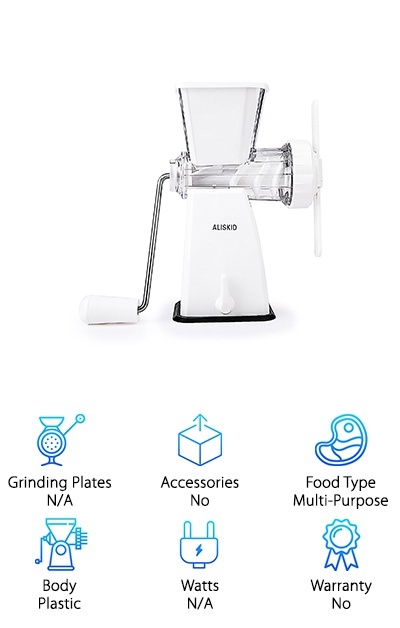 The best manual meat grinder is versatile, so this choice fits the bill. The KitAidPro 3-In-1 Meat Grinder is a multitasker in every way. 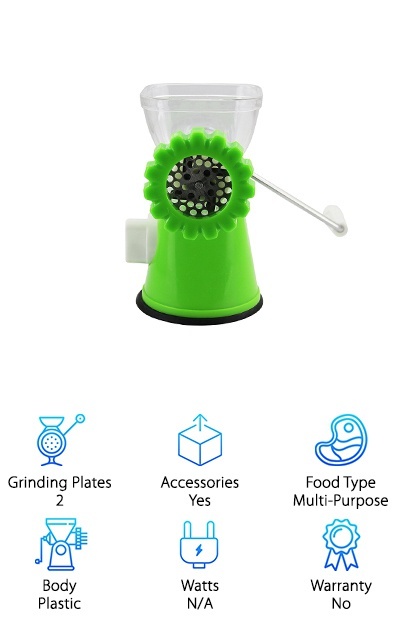 This manual grinder grinds meat, vegetables, garlic, and whatever else you need to mince into fine pieces. Its two plates will give you a coarse mince or a fine mince, depending on your preferences. And there’s more: you can make sausages in three different sizes with the sausage funnels included. Finally, this grinder is also great for making pasta! Select from rigatoni or spaghetti, insert the dough and turn the crank. This machine is small but mighty. It will fit on your kitchen counter, and stay put with a suction cup on the bottom. Make everything from sandwich spreads to your own salsa! We looked for the best meat grinder for home, and this one quickly made our list. It isn’t just the quality of the grinder our reviewers liked… it was also the quality of the accessories. You’ll be making homemade sausage, patties, meatballs and more with the Gourmia Meat Grinder. The opportunities are endless! Here’s what you get: a quality grinder with steel gears to process everything from poultry to big game. Three grinding plates are included, so you can select from a fine, medium or coarse grind. Food pusher, sausage and kibbeh attachments will also arrive. Not to mention the free e-cookbook and gourmet recipes! Think about it: everything from jerky to hash is now a possibility in your own kitchen. This is an affordable grinder with a great deal of potential. It has a powerful 500-watt output, with capabilities similar to some commercial grinders. If you’ve ever thought about saving some money and processing your own meat, choose Gourmia! 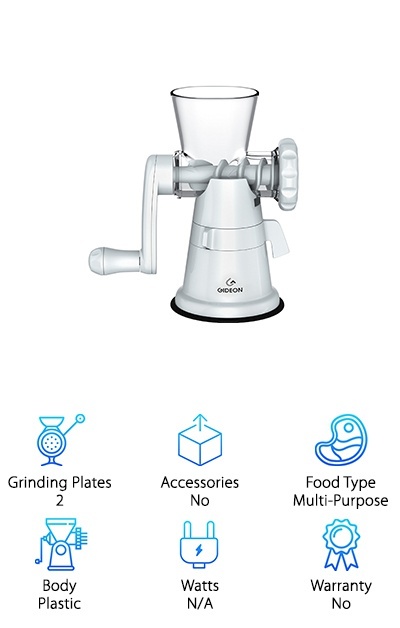 The idea of an at-home grinder can be an intimidating one, but those worries go away quickly with the Gideon Manual Meat Grinder. Save money by grinding your own meat, vegetables, garlic and much more. How does it work? This compact grinder comes almost fully assembled. Select from one of two grinding plates – coarse or fine mince. Place your beef, chicken, carrots or other items into the chute, and turn the hand crank. It’s that easy! And it’s a thrifty purchase for the economical home chef. The blades and many other parts of the Gideon Meat Grinder are dishwasher-safe, so cleanup is easy too. Picture yourself prepping for winter stews, homemade sausage, canning or making pet food out of the freshest ingredients for your cat or dog. The neighbors will suddenly become more available for summer cookouts! You’ll be the most popular person on the block, by far. This grinder will make cooking for a crowd a breeze. The best commercial meat grinder is forceful, with consistently impressive results. Our reviewers selected the STX Turboforce Electric Grinder both for its reputation and its strength. It’s a great choice both for small restaurants and the avid at-home cook. This grinder is more than capable, with 3,000 watts of peak output power. 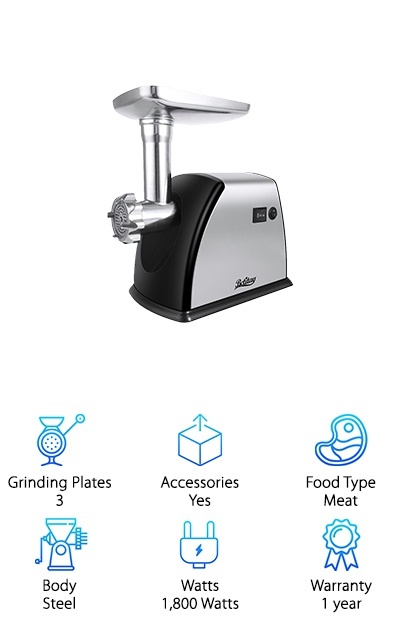 You’ll also receive a long list of parts and accessories for getting the perfect grind for that burger or sausage recipe. Let’s start here: with 3 grinding plates for a fine, medium or coarse grind. There are also 3 different stainless steel blades for varying cutting consistency. If you’d like to create your own sausage, you have 3 different sausage-stuffing tubes with an adapter and a kibbe attachment. (Kibbe is a traditional Middle Eastern dish made with beef, lamb or goat.) The best part? The warranty! STX offers to fix or repair your electric grinder for three years after purchase. Start your own kitchen revolution today! The best meat grinder for venison doesn't create a lot of mess and offers a simple do-it-yourself setup. Our reviewers really liked the Betitay Electric Meat Grinder for those reasons and much more. Processing your own meat means you control the process and the ingredients. No mystery chemicals, no food sitting out in the grocery store. It’s fresh and ready to go. If you’ve ever thought about grinding your own meat but said “No, it’s too much work,” perhaps the Betitay will change your mind! It’s got a lot of persuasive features, beginning with its sturdy all-steel frame. 3 grinding plates are included for a fine, medium or coarse mince. You also receive accessories to make kibbe and sausage. Place your meat in the hopper and go to work – and feel the pride that comes with doing things yourself. Blend different kinds of meat to come up with custom recipes for everything from meatloaf to burgers to tacos! Say goodbye to the butcher’s counter and start up your own meat-grinding operation! 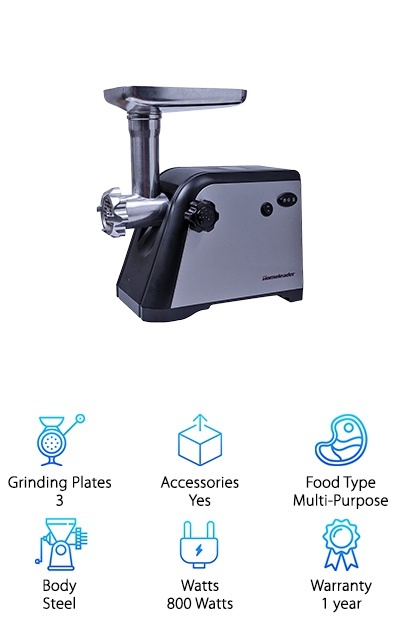 Selecting and purchasing your very own grinder is one of the best ways to control the quality of the food you’re eating at home. It’s also an easy way to have the freshest meat on hand and ready to go. And finally, it’s another great way to stay healthy, since the meat you grind at home can be processed with little fat and gristle. The Homeleader Electric Meat Grinder is one of the best products out there, according to our reviewers. Select from the 3 grinding plates included for either a coarse, medium or fine mince. It gets better: this grinder is designed for much more than just meat! In fact, it comes with a tomato juicer and a vegetable shredder. Make your own juices, sauces, salsas, coleslaw or hash browns! You’re only limited by your own imagination! The parts for making sausage are also included. 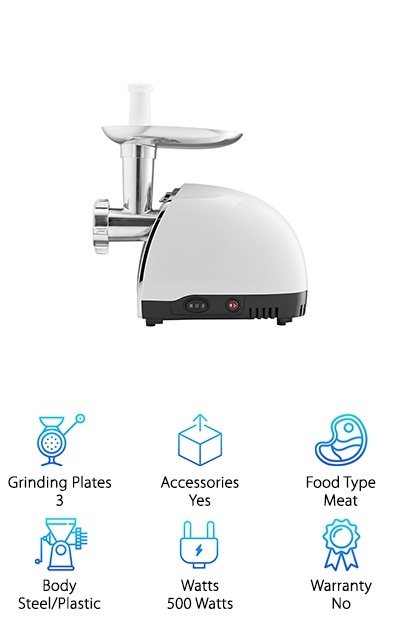 If you’re serious about your meat-grinding game, take a look at the Happybuy Electric Meat Grinder. This beast is a contender for both at-home and commercial meat production. What’s the secret? Those 750 watts of peak output power. It can do the work needed in supermarkets, restaurants, butcher shops and more. 2 stainless-steel cutting knives come with purchase. You will receive 5 stainless-steel grinding plates of different sizes for mincing. A plastic pusher, meat tray, feeding plunger and sausage filler are also included. One of the biggest reasons for buying your own meat grinder is cost. If you are a hunter, the savings of processing your own animals can be huge. A meat grinder of this caliber can tackle all kinds of game! Use this machine to put meat away for weeks to come, for entertaining, or for ordering fresh at your butcher shop. Come up with your own blends for sausages and burgers and throw a party everyone will remember! Have you ever bought a burger at a restaurant, bit into it, and said: "Hey, I can do that!" It really is possible to do at home with the right equipment. The best meat grinders are highly functional, easy to use, and help you to make some of the best hamburgers you’ve ever had. 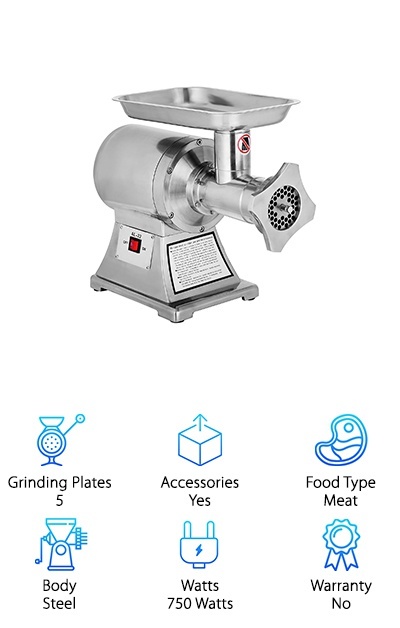 Our reviewers say the Della Meat Grinder ranks right up there with the very best available, thanks to its intuitive design and powerful capabilities. Let’s start with its steel construction and maximum 1,400-watt peak power output. The multi-purpose grater comes with 3 grinding plates in coarse, medium and fine mince. You also get a meat pusher and a kibbe attachment, along with a steel cutting blade. This is crazy: it’s all accessible at an affordable price! Cut the butcher and sky-high meat processing costs out of the equation, and start doing it all yourself. Become a hero to man’s best friend and start making quality pet food at home. Are you new to the DIY movement? Does the idea of processing and grinding your own meat sound a little intimidating? The fact is, there are great products out there ready to make food production a breeze. No, really! The ALISKID Meat Grinder is a perfect example. Compact and at your disposal, it can be used to create anything from the perfect meatball to a dynamite chili rub. Are you intrigued now? The ALISKID comes armed with powerful suction to anchor to your countertop and stay put while you come up with culinary inventions. Chop and mince garlic, break down zucchini or carrots for veggie patties, or toss in some watermelon and mint for the ultimate slushy! No need to switch out parts or deal with a larger, more cumbersome machine. Its simple functionality will blow you away. The hand crank means you control its speed while making burgers, sausages or mincemeat. Let the ALISKID Meat Grinder unveil a new menu!